singer and famous actress of Bengali cinema. Born on 22 April 1947, Shakuntala Barua is an accomplished singer (who learnt music from the stalwarts from Suchitra Mitra, Dilip Kumar Roy and Krishna Chattopadhyay) and famous actress of Bengali cinema. Her acting career started in 1979 when she debuted in the film “Sunayani” where she had as her co-star, Uttam Kumar, the legendary star of Bengali film industry. Her notables films include “Rajnandini”, “Saheb”, “Suryasakshi”, “Protishodh”, “Sankalpa”, “Samarpan”, “Tanaya”, “Jiban-Moron”, “Simantoraag”, “Shatru”, “Prarthana”, “Agnishuddhi”, “Yog-Biyog”, “Ashirbaad”, “Rudra-beena”, “Guru Dakshina”, “Gayak”, “Ekanto Apon”, “Amar Sangi”, “Ora Charjon”, “Agomon”, “Toofan”, “Mone Mone”, “Chokher Aloye”, “Angaar”, “Asha O Bhalobasha”, “Amar Prem”, “Amanat”, “Akrosh”, “Amar Tumi”, “Sati”, “Mandira”, “Jiban Sangini”, “Devata”, “Balidaan”, “Apon Amar Apon”, “Prothom Dekha”, “Moni Kanchan”, “Hirer Angti”, “Misthi Madhur”, “Atithi Shilpi”, “Wheel Chair”, “Shesh Chithi”, “Tumi Je Amar”, “Dhushor Godhuli”, “Baba Loknath”, “Shesh Praktiksha”, “Mashal”, “Antartomo”, “Banophool”, “Saptami”, “Joyee”, “Jiban Sandhan”, “Dahan”, “Atmiyo Swajan”, “Shesh Thikana”, “Prem Priti Bhalobasha”, “Porinoti”, “Nayak”, “Pitribhumi”, “Sedin Dekha Hoyechilo” and “Amrita” to name a few. Secretary, Sree Sarada Ashrama and Sree Sarada Ashrama Balika Vidyalaya, New Alipore (Kolkata). Sree Sarada Ashrama, is an old religious, philanthropic organization established in 1956, at New Alipore ‘O’ Block by Bani Debi and Mira Debi, the two ardent devotees of Holy Mother Sree Sree Saradamoni Devi. The Holy Mother is the central figure of this women’s organization. The Ashrama follows the ideals and the way shown by Sree Sree Maa to practise spiritual disciplines and carry out day to day activities. The Ashrama aimed at self emancipation and upliftment of human being through spiritual development and selfless services to the society, especially to women. Presently the Ashrama successfully runs the Sree Sarada Ashrama Balika Vidyalaya (established in 1957)—a renowned Higher Secondary School offering education in both English and Bengali medium—recognized by West Bengal Board of Secondary Education and West Bengal Council of Higher Secondary Education. Sree Sarada Ashrama arranges free medical camp for under privilege person. Special eye camps are conducted every year for the benefit of poor patients. Eye test, cataract operation and spectacles are provided free of cost. Free medicines, clothes to the poor women and girls are distributed every year. Its centres at Kalyani and Raghunathpur run charitable dispensaries for women and children and provide them with free medicines. The Ashrama also spreads education among financially backward students. It runs a charitable tutorial class named ‘Vivekayan’ arranged for underprivileged students of various schools. It also runs a library exclusively for women and publishes an annual magazine titled Pushpanjali with contributions from ladies only. Hailing from the illustrious zamindar family of Basirhat (now in North 24 Parganas), Chitra Bose was born on 17th March 1933 to Harendra Nath Majumdar and Santi Majumdar. Harendra Nath Majumdar, a nephew of Swami Brahmananda (a direct disciple of Sri Ramakrishna and the first President of Ramakrishna Mission), was a noted Congressman and active participant in the struggle for India’s independence. He was in the company of Mahatma Gandhi during his stay at Haidari Bhavan at Beliaghata. Later, Harendra Nath Majumdar became a minister in the cabinet of Dr. Prafulla Ghosh (the former Chief Minister of West Bengal) in the late 1960s. A devotee of the Mother, he was also the erstwhile Chairman of Sri Aurobindo Society West Bengal. From her childhood days Chitra Bose came in touch with personalities like Dr. Bidhan Chandra Roy, Dr. Prafulla Ghosh, Sri Atulya Ghosh and other eminent persons. She did her schooling from Brahmo Girls School and later graduated from Presidency College, Kolkata. 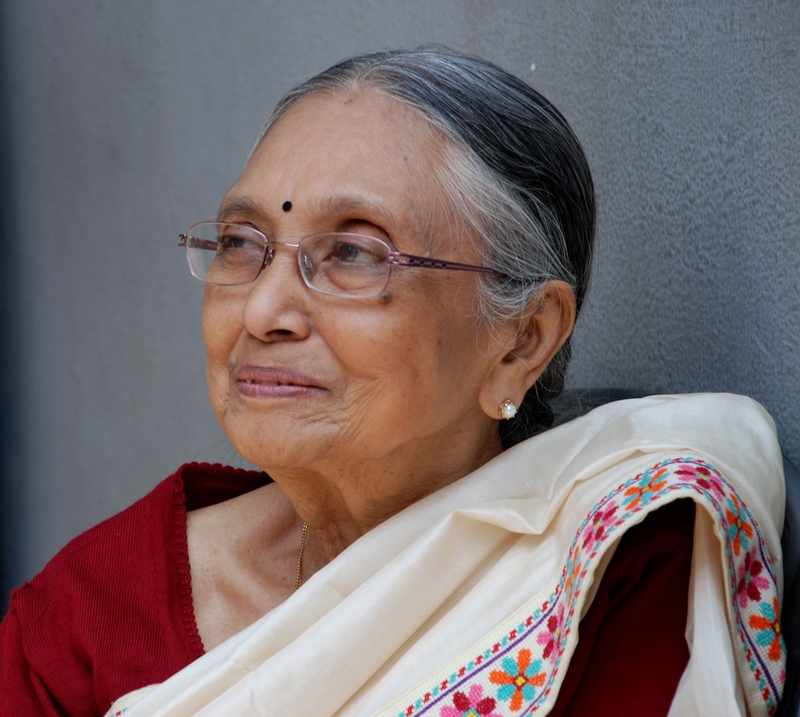 Eminent scholars like Prof. Amartya Sen and Prof. Sukhomay Chakravarty were her batchmates. She met the Mother at Sri Aurobindo Ashram, Pondicherry, where she used to visit with her father. She married K.C. Bose, the later Additional General Manager of Eastern Railway in the Indian Railway Service. After the Sakti Centre was established in New Alipore in 1972, a kindergarten school was established there by her, christened Sri Aurobindo Bal Mandir with only 5 students and mattresses to sit upon owing to lack of basic furniture in the then dilapidated building. Under her stewardship, Sri Aurobindo Bal Mandir grew up to be one of the eminent pre-primary schools of south Kolkata based on the ideas and ideals of Sri Aurobindo and the Mother, providing quality education with a present strength of 350 students in Nursery and Kindergarten sections. She is the mentor and guiding force of the school.